RNL has launched AL, our fundraising AI chatbot. If you saw our announcements about AL or have followed the growing interest in the use of AI for fundraising, you may wonder how a fundraising AI chatbot fits within the broader strategic framework of fundraising. Do you have the budget to add an army of staff members for connecting with alumni? The answer is likely no, which is why artificial intelligence is becoming increasingly important for advancement. AI can deliver personalization at scale, solving challenges across the full student lifecycle. AI can help you engage engage students, parents, alumni, and others in a more personalized manner and act on key pain points/questions they have in real-time. It also allows you to learn more about your audience, enabling you to evolve your marketing messages based on real-data. That makes it easier for you to meet the expectation of personalization that alumni, donors, and frankly all consumers now have. Engagement and conversion are primary objectives of all outreach with alumni and donors, and much of that engagement now takes place via digital communications: your website, social media, digital advertising, and so on. 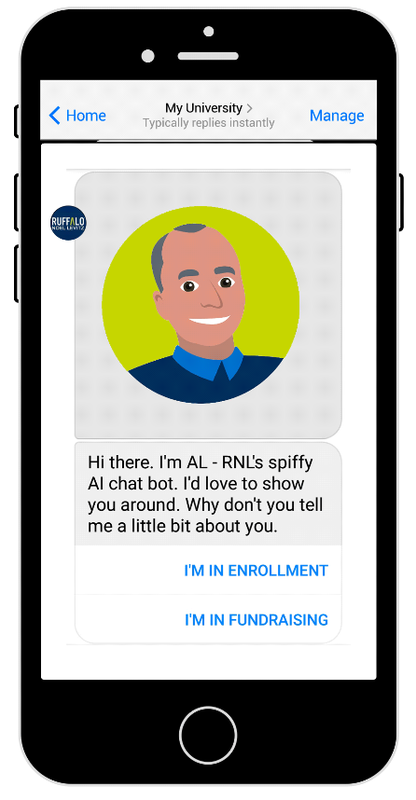 AL, our fundraising AI chatbot and messaging solution, is the logical progression for how RNL is helping institutions make those connections. Let me be clear: an AI chatbot is not a magic wand for fundraising (spoiler alert: there is no magic wand for fundraising). However, it is also very clear that fundraising AI chatbots have enormous potential to create personalized engagement while also freeing up your limited resources for connections that truly require the human touch. We have integrated AL into our full suite of omnichannel solutions, giving you a new channel to connect with your constituents and give them key information in a way that seems personal. When an alumnus has a question, the AI chatbot is there to help answer questions and to send follow up messages to keep them engaged and informed. The institution can also see the type of questions alumni are asking, which can then inform their marketing communication strategy. When an institution is planning a giving day and wondering how they can keep up with the litany of questions, how to increase conversion, and how to thank donors in a personalized way, Al has built-in integration with RNL Digital Giving that allows for the chatbot to easily be embedded within a giving day or crowdfunding campaign. As for the name AL, it honors the transformative work one of our founders, Al Ruffalo, accomplished in the higher ed market, as well as to mark the continued transformation that RNL is building on our strong foundation of solutions. 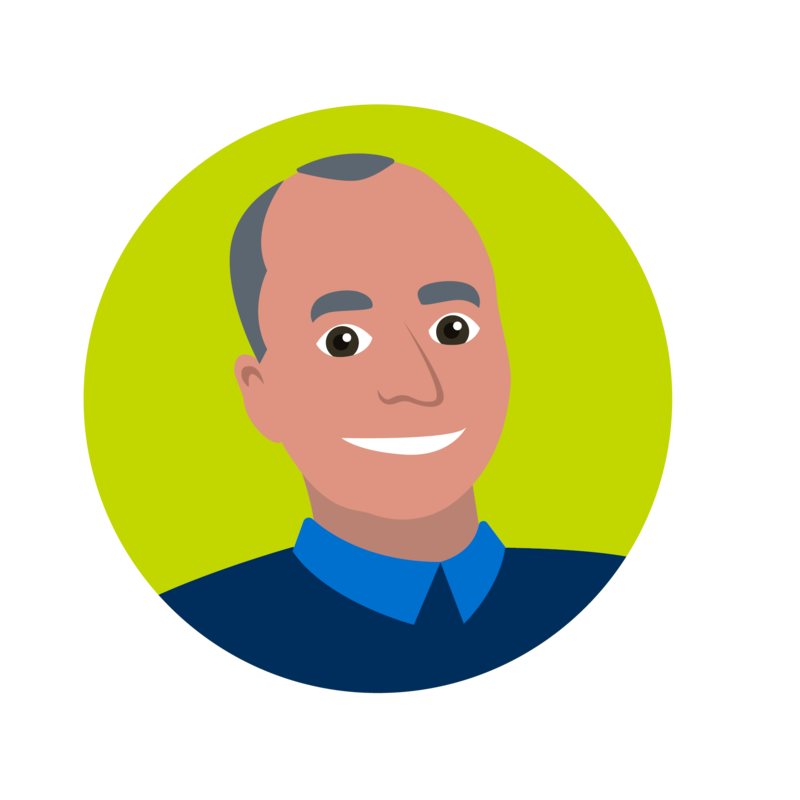 We have AL all ready to talk with you—stop by for a chat and see what AL can do. And keep in mind that AL is fully customized to your institution, so that your chat avatar and branding reflect your institution and reinforce the connection with donors.